I haven't seen the First Order Snowtrooper Officer in stores since I got mine last month, but hey - it's new! This exclusive takes a plain Snowtrooper (which isn't out yet) and adds a pauldron, thus making it a better figure than the regular release is likely to be. If you can get it, it's pretty slick - so good hunting. Read on! If you like new droids, Yakface.com has some exciting news for you - the Holiday 2015 droid aptly named R2-H15 is out now! Actual pricing was not reported, but other droids in this line have been $12.95 and eBay prices (and mark-ups) seem to indicate that's about the going rate. Good hunting! UPDATE: Amazon re-opened pre-orders for this week! $79.99 with free shipping. Order it before they pull it down again! UPDATE #2: Amazon pulled new orders down again. Check back for more. It's here! Or it'll be here tomorrow, Amazon tells me. If you pre-ordered the Star Wars The Black Series 6-Inch Stormtrooper 4-Pack [Amazon Exclusive] back in September you might have it as early as tomorrow (Sunday). It appears Amazon is not currently taking more orders for this set, but you can click here to check availability in case it comes back. It was originally $79.99 when pre-orders went up September 4. If you're like me, you're a) cheap and b) don't have the Target exclusive Star Wars The Force Awakens Black Series 6in Figure Set just yet. Right now it's in stock for $39.99 and it ships free - plus if you use the code BESTGIFT during checkout, you get $10 (25%) off. I just placed my order, and if you don't have yours yet it's as good of a time as any to do so. Click here to check availability. Thanks for the tip, Phil! An Entertainment Earth exclusive, the desert flavor of the Stormtrooper Officer comes with a red pauldron and a totally different paint job on his Assault Walker. It's a little whiter than the jungle trooper, and looks like it should fit right in on a Jakku shelf. It's also shipping right now. Read on! For $19.99, Toys R Us is now receiving cases of the First Order Snowtrooper Officer. I saw several at a Phoenix area Toys R Us, so it's possible if you missed the online pre-order you might just stumble on them over the next week or two. Update: note this one has a TRU silver sticker - some don't. Good hunting! It seems that the figure is very similar to the basic version other than the pauldron, but we'll know for sure once it starts to ship in the next month or three. Are you finding anything interesting? Let us know! Leave a comment or send us an email - we're hearing a lot of buzz, and we love getting confirmations. It's here! 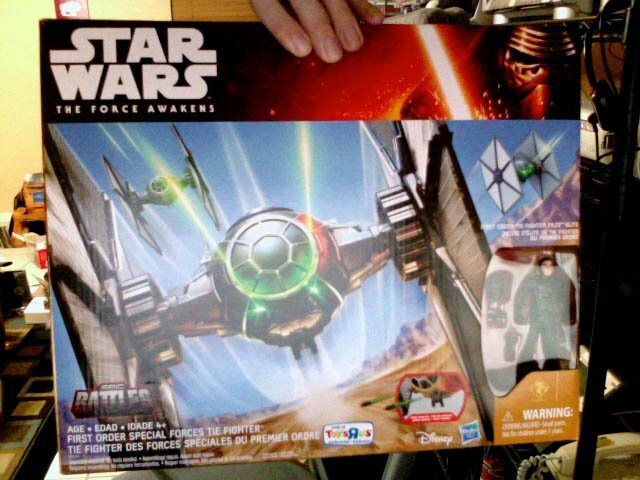 Very few new exclusives have actually hit, but Toys R Us' exclusive First Order Special Forces TIE Fighter is out now. You get a little more paint for $42.99, a $3 markup over the regular version at $39.99. The pilot is very similar to the regular version, but with added red stripes on his helmet. If you've seen the 181st Pilots or some of the specially marked ones from the original trilogy, you know what to expect. The TIE itself has some light brown dusting, but not any scorch marks on the wings. Just dust. The good news is that both the figure and vehicle are both visually quite interesting. The bad news is that it lowers the bar for vehicle deco variants - snow on the boots were a thing we've seen on figures for a few years, but sand damaged vehicles is, of course, a completely new thing. Hasbro or not Hasbro? 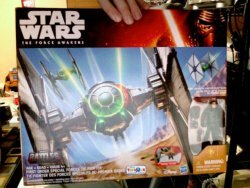 We're still not 100% sure, but we do know that a new Droid Factory Boxed Set has popped up at theme parks and on eBay. Reader Michael passed along the details - $29.95 gets you four droids (a real bargain!) including the first-ever R0-4LO and the first action figure of R5-X3 - this was previously sold as a Tomy RC droid and was slated for the axed Legacy Collection. Also included are R2-Q2 with a different paint job - seriously, new panels and all - plus the first new R4-I9 since 2002. The box boasts they're from the new movie, but I'm curious to see if this is true. Star Wars The Force Awakens 3.75-Inch Figure Troop Builder 6-Pack - actually has 7 figures. Captain Phasma is joined by uniquely armored Stormtroopers and Snowtroopers. The fact that it is not actually a six pack once again robs me of Black Flag jokes. Star Wars The Black Series 6-Inch Stormtrooper 4-Pack - This is the rumored "evolution" set. Each figure is unique - Stormtrooper has dirty deco, Episode 7 Stormtrooper has a unique pauldron, the Episode III Clone Trooper debuts in this set, and the AOTC yellow Clone Captain is new. There's always hope! Walmart has 3 figures up for grabs now and more are coming. Tonight you can order Luke Skywalker (dirty boot redeco recolor of 2012 Vintage Blu-Ray Jedi Luke), Darth Vader (repack, possible redeco of the 500th Vader mold), and Chewbacca (possible redeco of 2004 Vintage Chewbacca.) I'm in the middle of a series of large crises so I'll update this with facts (or your comments) as time permits. As you wait, click below to see the figures at Walmart.com. Upcoming releases include the unreleased Ceremonial Leia, Kylo Ren, and a First Order Stormtrooper. We're in a hurry, so I'm pasting this in real quick - The Black Series 3 3/4-inch aren't quite dead. Where did they go? Find out after the jump. Hasbro sent along a handy-dandy list in a press release, and here you go. If you ain't seen it, the Walmart Exclusive Funko Pop! Vinyl Sandtrooper and Dewback may be at a store near you - and if it's like my local Walmart, it's literally the only Star Wars thing on the aisle. The two-pack is $20.00 which means it's quite the decent deal. Good hunting! Ad: Nesting dolls! They're not just for Eastern Europe anymore. The Star Wars Jabba's Palace Nesting Dolls - Entertainment Earth Exclusive set is up for grabs right now. $16.99 gets you Jabba the Hutt with Salacious Crumb, a Gamorrean Guard, Max Rebo, Droopy McCool, and Sy Snootles. Click here to get yours! Ad: You read that right - this is a debut of a new exclusive, and it's already in stock! The Star Wars Clone Trooper Utapau Premium Hikari Figure - Entertainment Earth Exclusive is in stock and qualifies for free shipping in the USA. It's $79.99, 600 were made, and it just went on sale. If you want one, click through and order now!